An international, multi-disciplinary team explores the many different facets of terrorism, investigating what it means to be a terrorist and what terrorism means for society. David Canter is Professor of Psychology and Director of the International Research Centre for Investigative Psychology at the University of Huddersfield, and founding editor of the Wiley Journal of Investigative Psychology and Offender Profiling. He has worked with police forces all over the world on 'profiling', which led to the emergence of Investigative Psychology. This has included unique studies of terrorists. Since 1986, Professor Canter has contributed to over 150 investigations of many different kinds of crimes around the world, and was recently awarded a BPS Honorary Fellowship. He has also written two award-winning books, Criminal Shadows: Inside the Mind of the Serial Killer (1995) and Mapping Murder: The Secrets of Geographical Profiling (2003). 1. 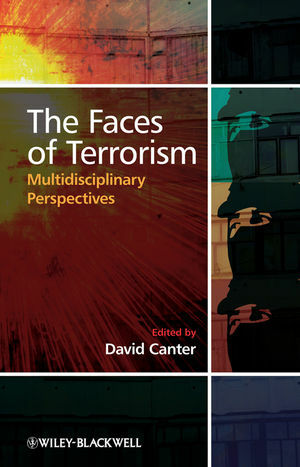 The Multi-Facetted Nature of Terrorism: An Introduction (David Canter). 2.From Naïvety to Insurgency: Becoming a Paramilitary in Northern Ireland(Neil Ferguson, and Mark Burgess). 3. The Rhetorical Foundation of Militant (Sudhanshu Sarangi and David Canter). 4. Case study: The Puzzling Case (from a Western Perspective) of Lone Terrorist Faheem Khalid Lodhi (Clive Williams). 5. The Primacy of Grievance as A Structural Cause Of Oppositional Political Terrorism: Comparing Al Fatah, Farc, and Pira (Jeffrey Ian Ross). 6. Case Study: The 17th November Group: Europe’s Last Revolutionary Terrorists. (George Kassimeris). 7. Terrorism and Organized Crime: A Theoretical Perspective (Dipak K. Gupta, John Horgan and Alex P. Schmid). 8. Terrorist Networks and Small Group Psychology (Sam Mullins). 9. Case Study: Youth Gangs and Terrorism in Chechnya: Recruitment, Activities and Networks (Michael Vishnevetsky). 10. The Enemy of My Enemy is My Friend (Kevin Borgeson and Robin Valeri). 11. The Business of Kidnap for Ransom (Everard Phillips). 12. Case Study: Ramzan Kadyrov in Chechnya: Authoritarian Leadership in the Caucasus (John Russell). 13. From 7/7 to 8/10: Media Framing of Terrorist Incidents in the United States and United Kingdom (Mary Danis and Michael Stohl). 14. Cyberterrorism: The Emerging Worldwide Threat (Amanda M. Sharp Parker). 15. Disengaging from Terrorism (John Horgan). 16. De-radicalization and the Staircase from Terrorism (Fathali M. Moghaddam).